This is the tenth in a series of articles about the basics of developing SharePoint-hosted SharePoint Add-ins. You should first be familiar with SharePoint Add-ins and the previous articles in this series, which you can find at Get started creating SharePoint-hosted SharePoint Add-ins. If you have been working through this series about SharePoint-hosted add-ins, you have a Visual Studio solution that you can use to continue with this topic. You can also download the repository at SharePoint_SP-hosted_Add-Ins_Tutorials and open the BeforeJSOM.sln file. Open the file /Pages/Default.aspx from the root of the project. Among other things, this generated file loads one or both of two scripts that are hosted on SharePoint: sp.runtime.js and sp.js. The markup for loading these files is in the Content control near the top of the file that has the ID PlaceHolderAdditionalPageHead. The markup varies depending on the version of Microsoft Office Developer Tools for Visual Studio that you are using. Then search the file for any other markup that also loads one or the other of these files and remove the redundant markup. Save and close the file. Right-click the Scripts node and select Add > New Item > Web. Open Add-in.js and delete its content, if there is any. The clientContext variable holds an SP.ClientContext object that references the SharePoint website. All JSOM code begins by creating, or getting a reference to, an object of this type. 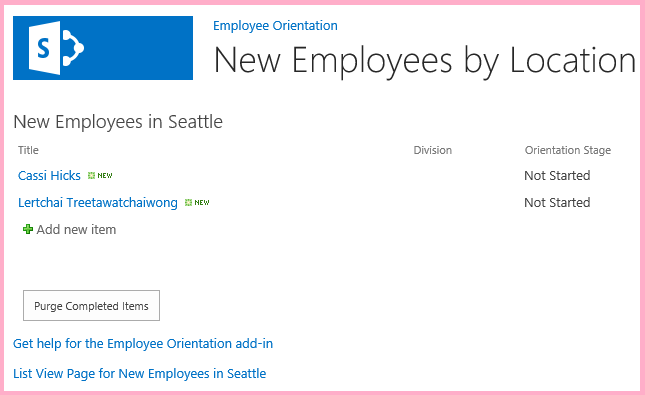 The employeeList variable holds a reference to the list instance New Employees in Seattle. The completedItems variable holds the items from the list that the script will delete: the items whose OrientationStage field is set to Completed. To minimize messages between the client browser and the SharePoint server, the JSOM uses a batching system. Only one function, SP.ClientContext.executeQueryAsync, actually sends messages to the server (and receives replies). Calls to the JSOM APIs that come in between calls of executeQueryAsync are bundled up and sent to the server in a batch the next time executeQueryAsync is called. However, it is not generally possible to call a method of a JSOM object unless the object has been brought down to the client in a previous call of executeQueryAsync. Your script is going to call the SP.ListItem.deleteObject method of each completed item on the list, so it has to make two calls of executeQueryAsync; one to get a collection of the completed list items, and then a second to batch the calls of deleteObject and send them to the server for execution. Begin by creating a method to get the list items from the server. Add the following code to the file. When these lines are sent to the server and executed there, they create a collection of list items, but the script must bring that collection down to the client. This is done with a call to the SP.ClientContext.load function, so add the following line to the end of the method. Add a call of executeQueryAsync. This method has two parameters, both of which are callback functions. The first runs if the server successfully executes all the commands in the batch. The second runs if the server fails for any reason. You create these two functions in later steps. Add the following line to the end of the method. Finally, add the following line to the end of the method. By returning false to the ASP.NET button that will call the function, we cancel the default behavior of ASP.NET buttons, which is to reload the page. A reload of the page would cause a reload of the Add-in.js file. That, in turn, would reinitialize the clientContext object. The SP.ListItem.get_id method returns the ID of the list item. Each item in the array is an SP.ListItem object. The SP.List.getItemById method returns the SP.ListItem object with the specified ID. The SP.ListItem.deleteObject method marks the list item to be deleted on the server when the call of executeQueryAsync is made. The error message isn't literally true, because the item isn't really deleted from anything until the deleteObject calls are bundled and sent to the server, but the JSOM is designed to mimic the exception throws that would occur on the server (where code should not change a collection size while the collection is being enumerated). However, arrays have a fixed size, so calling deleteObject on an item in an array deletes the item from the list, but does not change the size of the array. Add the following function, onDeleteCompletedItemsSuccess, to the file. This is the function that runs if the completed items are successfully deleted (or there aren't any completed items on the list). Add the following two callback-on-failure functions to the file. Open the default.aspx file and find the asp:Content element with the ID PlaceHolderMain. Add the following markup between the WebPartPages:WebPartZone element and the first of the two asp:Hyperlink elements. Note that the value of the OnClientClick handler is return purgeCompletedItems() instead of just purgeCompletedItems(). The false that is returned from the function tells ASP.NET not to reload the page. Rebuild the project in Visual Studio. To minimize the need to manually set the Orientation Stage of list items to Completed while testing the add-in, open the elements.xml file for the list instance NewEmployeesInSeattle (not the elements.xml for the list template NewEmployeeOrientation) and add the markup <Field Name="OrientationStage">Completed</Field> as the last child to one or more of the Row elements. The following is an example of how the Rows element should look. Enable pop-up windows on the browser that Visual Studio uses when you debug. The home page of the add-in opens, and there are one or more items on the list with Orientation Stage at Completed. When the start page of the add-in has completely loaded, select the Purge Completed Items button. If the operation succeeds (you don't get any failure message), all the Completed items are deleted and you'll see a pop-up window that says Completed orientations have been deleted. Close the pop-up window. The page reloads, and the Completed items are no longer in the list view web part.